Making a positive change in eating habits is a hard, daunting, and—sometimes—torturous thing to do, especially around the holidays. In American society, feeling guilty about being overweight or about your choices in diet is, unfortunately, easy to do. But what if we stopped feeling guilty and started making changes that promoted a more positive outlook to weight loss and eating habits? It is important to remember that our bodies are designed to make and store fat. So being overweight and feeling guilty about it is not your fault. As science has progressed, the idea of what it means to eat healthy has changed dramatically, including the idea that eating whole grains, foods containing less fat (and more sugar), and processed starches is good for you. Although this article is not specifically focused on fad diets, it is important to know that diet trends and government guidelines shift – for better or worse – throughout the years. Getting off track with your food choices over the holidays, or any time of the year, is expected. The definition of obesity as defined by the Obesity Medicine Association includes the terms “chronic and relapsing.” This means the extra weight carried is not magically resolved overnight. It also means even when we have contolled and maintained a healthy weight, there will still be times of better or worse control. So when you find yourself getting off track, especially around the holidays, get right back on track. Easier said than done, right? 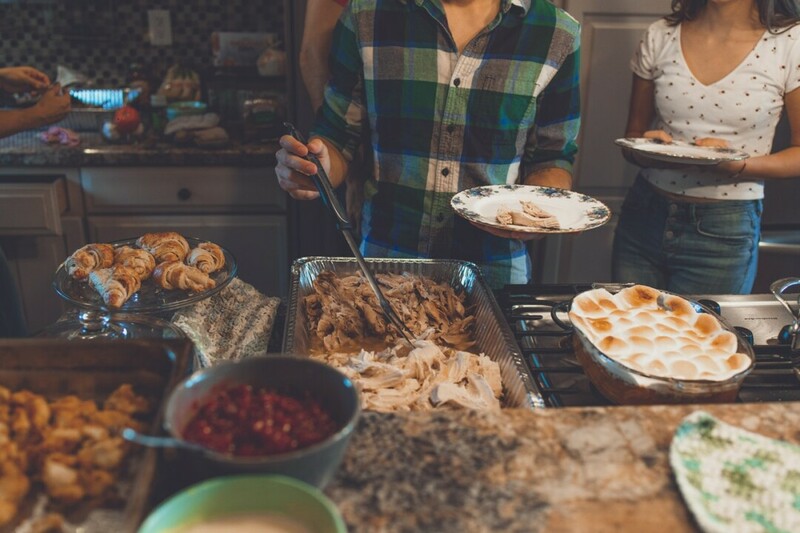 Start by planning ahead by knowing what food is going to be around during the holiday celebrations. If there is a food that is meaningful to you, plan to eat a portion-controlled amount of it and avoid the other foods that are not meaningful. One thing to avoid is eating out of convenience (“Oh look, more cookies!”) or boredom (“These chocolate covered pretzels will help pass the time.”) or just because it’s there (“Who put those chips there? I might as well grab a handful”). As society starts to become more informed of the particular food being consumed, now is the time to take control and create a personal bubble of health. Most people strive to be healthy and want to do the right thing in order to improve their health. It is just hard to navigate through all the contrasting nutritional information out there. What is important is your response to creating healthy eating habits that will support weight loss, reduce inflammation, and help control chronic disease. In order to create healthy eating habits that work for you, begin by working with your body’s natural metabolism and eat in a way that avoids an insulin response. Insulin is a hormone responsible for fat storing. When you eat in a way that limits the insulin response, you limit fat storing and allow your body to burn the extra fat it’s been storing all these years. Remember, you cannot burn fat and make fat at the same time. One strategy that may help to make dietary changes sustainable is to gradually reduce the carbohydrates in ways that make sense for you. A simple first step: evaluate your breakfast. What we once thought was healthy – orange juice/oatmeal/banana – is actually laden with carbohydrates and will tell your body to make fat instead of burn fat. Consider eating eggs as part of your daily morning routine. When you’re on the go, there are many quick and easy high protein/low carbohydrate products out there (just be careful to read the labels!) or just prepare your eggs ahead of time and you have not only a healthy breakfast to go but also a great snack for any time of day. Another way to slowly integrate change is to explore ways to avoid the potato, pasta, and bread component in the meals you love to eat. Reducing or eliminating these foods will leave you feeling better as a result of decreased inflammation. This could mean a reduction in headaches, better control of chronic disease, and improved sleep. Choosing any new way of eating is most effective when approaching it as a lifelong health strategy and not a quick fix or fad diet. Much like a vegetarian avoids certain foods, making the choice to avoid sugars, starches, and carbohydrates is also a lifestyle preference. Remember you are worth it and you will truly be amazed at how much better you feel. Christina Funk is a Family Nurse Practitioner who practices at ReforMedicine in Eau Claire, Wisconsin. She is also an Obesity Medicine Specialist and an active member of the Obesity Medicine Association.